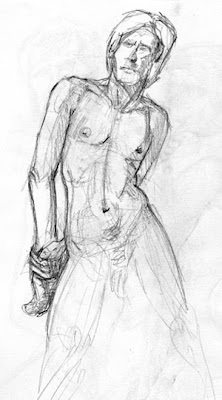 I headed to the YWCA in Santa Monica last night for some figure drawing. I was there last 8 months ago and absolutely loved it. Improv classes conflicted and I never ended up heading back. Now that I went, I'd like to make it a more consistent thing. It would mean 5 nights of my week would involve going out, but I'm all right with that. If I stop wasting as much time as I do on the computer, that still leaves time to get my own projects done. I'll save the rant I was going to type for later. Instead, this'll just be a posting of some sketches. Enjoy.